The dust has finally settled friends. Something had to give these past weeks and it ended up being this blog. My apologies for the lack of posts though I know you are all an incredibly understanding bunch of lovely people and you know the deal, so I won’t spend a lot of time hemming and hawing about it. Funny, as soon as I had a moment to myself, which was last night, I sat on my bed and read not one but five books at once. I think I am a little starved for quiet time and the written word. Today I have been very reflective, rummaging through old photographs and thinking about places, people and things I haven't had time to think about lately. I also managed to sneak out and buy a couple of pretty things to wear for the holidays which was really nice. While I was digging through my photos, I came upon this one of me taken at a Christmas brunch in 1990. 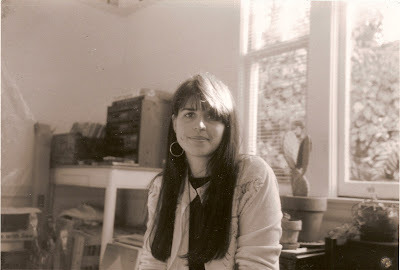 I had to count on my fingers (and toes) to add up how many years ago that was…I was a tender twenty-five years old and just had finished my first year of art school. When I reflect back on that time and what the girl in the photo was thinking, hoping and dreaming of it was to have the life of an Artist. Little did I know what would become of me. I worried then about what most twenty five year old girls worry about (err, boys…) but mostly I worried about whether or not I would ever become a real Artist. Already I was having it pounded into my head by my instructors that real Artists work twenty-four seven on their work. Real Artists will work through the night and into the wee hours of the morning to get a project done (the thought of this made me cringe as I really am not much of a night person, so working through the night sounded like pure torture). Real Artists have to give up the things that most people have, like having a family and a good income if they want to be prolific and productive Artists. Its true, I was really told that! I don’t believe that it is impossible to have a home, a family and good relationships or a decent income for that matter and be an Artist as well. I know plenty of successful Artists that have all of those things (all at once too!) but it is no easy task. I admire them greatly! So here I am today…and today when I saw this picture and thought about where I was then and where I am now, I realized I became what I wanted to become. A real Artist! I work twenty-four seven, my work is my life. I have even worked into the wee hours of the night, which in my book definitely puts me in the real Artist category. It is so satisfying and honestly in so many ways though I have been at it for well over twenty years now I really feel like I have only just begun. Speaking of beginnings, I will be starting a new blog project in 2008. I hope you will check back in the New Year and share in this new adventure with me. For now have a warm, safe and relaxing holiday friends. I so appreciate all the kind words of support and encouragement you have given me throughout the year...They have gotten me through many a long cold night at the studio.